Banc de Binary have ceased trading. The firm is no longer accepting new accounts. Return to the broker comparison table to search for an alternative broker. 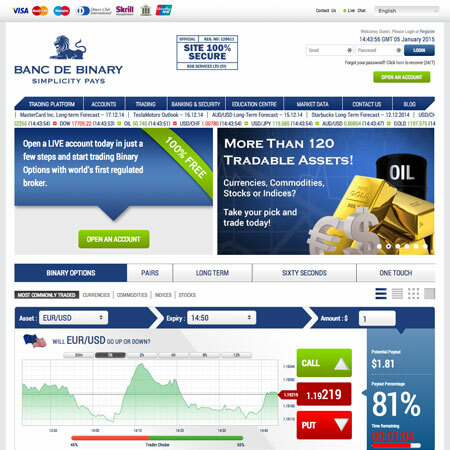 Banc de binary are the world’s leading binary options brokerage. Their global reach is what sets them apart from rival online trading brokers. They offer binary options in over 180 tradeable assets spread over 30 different countries. They provide services for traders in as many as 80 different countries around the globe. Their company motto is “simplicity pays“, and that ethos runs throughout the business. Signals service – Yes. Via trading central, available as part of Silver or Gold account packages. Bonus details – Up to 100%. Mobile App – Yes. Android and iOS. Banc de Binary offers a fast, user-friendly method of trading options. The trading area follows a familiar, clear layout, with all the relevant information easily found. The top of the trading platform lists the type of option available, and below that are the assets. There is a ‘Most popular‘ list, and then menus listing assets in their traditional groups – Currencies, commodities, indices and stocks. To the right of the assets are some options to amend the number of trading windows visible at any time. The central two options allow a large number of trades to be watched at once – but this means collapsing the price graph and reducing each window considerably. This can leave the trading area a little cluttered – but it might suit some traders and it is handy to have a configurable trading area. Below the options and assets comes the detail. So the specific asset to be traded, the expiry time and the trade amount. All are amendable via a drop down menu. Changing the trade amount updates the ‘projected payout’ figure beneath. Under the trade information bar is the main price graph. This can be amended to cover different timeframes, ranging from 30 minutes to 12 hours. On the right of the graph is the key information. The current price, and payout, the expiry countdown and the all important trading buttons. As the key information, these are all displayed clearly and are very intuitive. Finally there is a ‘Traders choice’ bar, which reflects the sentiment among other traders at that moment. The trading platform is clear, configurable and cannot be faulted. Who regulates Banc de Binary? Banc de Binary are regulated by CySEC (License 188/13). They are also registered with both the FCA in the UK and AML in France – but “registering with” is not the same as being “regulated by“. This is an important distinction. Banc de Binary offer a great range of binary option types. Binary Options – The traditional High/Low options. Will the asset rise in value, or fall? Pairs – Which of two assets – generally corporate stocks, but on occasion commodities or indices – will perform best? The pairs of assets will normally be related, for example Google versus Amazon, or Gold versus silver. Long term – Long term options follow the same principals as standard binary options – but the expiry periods are longer. Expiry times can be from a week or two, up to 9 or 12 months. These option favour traders who want to give their trades time for the fundamentals to have an effect. 60 Seconds – High octane trading! Again, the actual trade is similar to that of a standard binary option, but here, the expiry times are exceptionally short – 60 seconds or less. The assets lists at Banc de binary are large, and it is a clear strength. Some brokers will have even longer asset lists, but Banc de binary are certainly among the leaders in this regard and offer all the most popular assets. 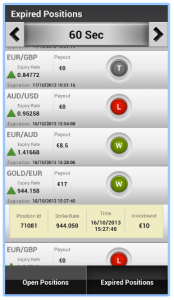 Banc de binary offer a completely free mobile trading app. It offers full access to all of the assets available on the full website, so traders can react immediately to news and events that may shape future price movement. The app is available on iOS (iPhone and iPad) and android. The trading platform is kept clear and simple to ensure it is as useable as possible. Open and expired trade information can be displayed, in addition to the account balance and funds available. Live charts are also available via the mobile app, and these in particular have been thoughtfully designed for smartphones and tablets. Despite the potential problems with display size, the charts are presented very well, and are useful for analysis on the move. Lastly, account management features are available too, including the ability to deposit via the app. So traders have everything they need on the trading app to react quickly to market changes, wherever they may be. Banc de Binary typically returns 86% on options. The payouts will vary depending on the asset and the expiry time of the trade. While Banc de Binary does not offer some of the more exotic options that can lead to sky high payouts, their returns on the more popular trades are among the best in the business. So for the more traditional options, the payouts are very good. Deposits at Banc de Binary are simple and secure. There is a deposit option on the right of the screen as soon as a trader logs in. Once completed, deposits are available to trade immediately. There are a variety of deposit methods to choose from – credit card, bank wire transfer (international or domestic) and Skrill. As with other brokers, any withdrawals are generally returned via the same route that a deposit was made. Withdrawals can be made anytime, but there is a minimum withdrawal figure of £50. As with other brokers, Banc de Binary require some form of proof of identity before authorising a withdrawal. These delays can sometimes frustrate traders, so it is worth organising the proof of ID early. Banc de Binary request; A form of photo ID (driving license for example), and a recent utility bill. Both documents need to show the address of the trader. Once received, the account with be authorised to make a withdrawal. If a credit card was used to deposit funds, Banc de Binary also like an image of that card (front and back). These steps are necessary to protect traders, and also to ensure their funds are separated and protected. Most withdrawals should be processed within 5 working days and Banc de Binary does not charge a fee for any withdrawals. A withdrawal with a ‘pending‘ status can also be cancelled any time – handy if funds are needed back in the account. When Banc de Binary generate complaints, they revolve around the ‘account managers’. These people are employed by the broker, and contact clients with “trading advice” and highlighting investment opportunities. The complaints however, suggest that these managers are often causing traders to trade beyond their means (encouraging large deposits) and also causing over trading, and subsequently, trading losses. If choosing to trade with Banc de Binary, our advice would be to ignore the account managers and their advice, or even specifically state in writing when joining, that you do not want any such service. The platform and trading functionality is top quality. These account managers however, continue to give the brand a bad name. International reach – Banc de Binary trades in over 100 countries around the globe., and offers trading assets in over 30. 24/7 trading – This broker offers 24-hour trading. Personalised service – Banc de Binary offers a personalised service, giving clients access to brokers and financial advisers. Loyalty rewards – Banc de Binary offers a number of bonuses for regular traders. Account Types – There are four types of account; Bronze, Silver, Gold and Lion Premium. Each level offers further benefits including gifts, trading alerts and private sessions with analysts. Educational resources at Banc de binary are being expanded all the time – they include videos and e-learning tools, as well as possible one to one tuition. The firm do offer a very personal service, but users must be aware of the upselling regime, and trade on their own. How do Banc de Binary make money? Banc de Binary offer ‘Over the counter’ binary options, and are the counter party to each trade. To understand how this relates to how they make money, read our detailed article on how binary options brokers make money.